The Lost Art of Second Chances is now in beta and should be coming to an e-reader near you in the next month. So, I thought I’d talk a little bit about that book, how it came to be, and share some research I did over the coming weeks here on the blog. I’ve participated in National Novel Writing Month (Nanowrimo) on and off for probably the past decade. Nanowrimo is a writing challenge conducted every November. Participants attempt to write fifty thousand words in a month. Now, that’s basically routine for me but before, when I worked in the salt mines of my old day job (kidding, my former co-workers, just kidding), it was a major challenge. Back in those days, I never pre-outlined or brainstormed a book. I just opened a blank page and started typing…only to stop about twenty thousand words in when I had no idea what I was doing. Nanowrimo 2011 was no different. I wanted to write a second chance at love story because it’s one of my favorite tropes. My uncle (and godfather) recently taught me to make summer sauce and so, I opened the story with the main character, Lucy, chatting away to her white cat as she made the sauce. That scene, in a much revised form, appears in chapter two of The Lost Art of Second Chances. As I was writing along, Lucy’s grandmother, Belladonna, appeared whole cloth and promptly took over the whole scene (and book too). I’ll talk about Bella’s story in another future post. Today, I wanted to talk about Frank. Lucy’s cat, unlike Bella, was not a wholesale invention of my imagination. 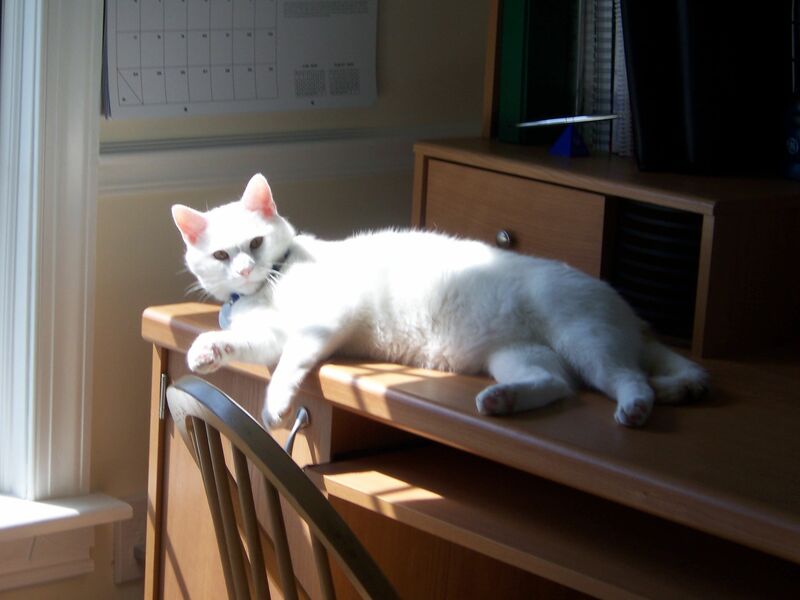 Frank was based on my own beloved white cat. The Pilot and I found Frank, and his sister, Carolina, as tiny eight week old abandoned kittens on my father-in-law’s farm. They’d taken refuge in a dilapidated barn. Carolina found me first and crawled up my jean leg into my arms. Frank was the little white puffball that followed her around. I scooped them both up and turned to my husband and father-in-law, who were both astounded that I’d managed to catch not one feral cat, but two. We brought them home and, after several courses of worm and flea treatments, and some remedial litter box training, they were both wonderful pets. 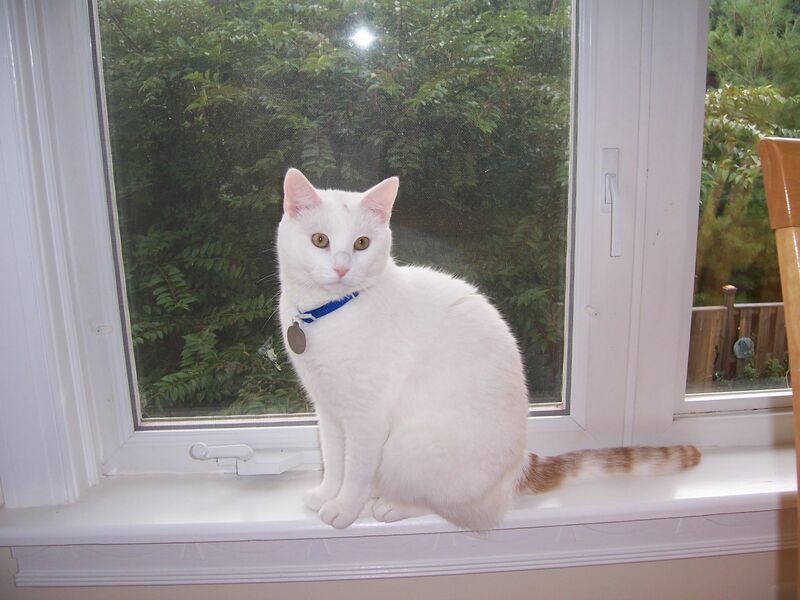 When Frank was about two, our amazing vet found a heart murmur and recommended a cat cardiologist. Thinking it was nothing, we visited only to find out that Frank had a genetic heart condition called feline hypertropic cardiomyopathy. We began a five year round of daily heart pills (which he detested) and semi-annual visits to the cardiologist with the dreaded EKG gel. We lost him the day before Fox’s first birthday, when Frank was just seven. Young for a cat. At midnight the night before, he did his sideways leap and ricochet routine off the front window and the living room furniture. At dawn, he had a stroke and was gone within an hour. It’s been nearly six years and I still miss him. 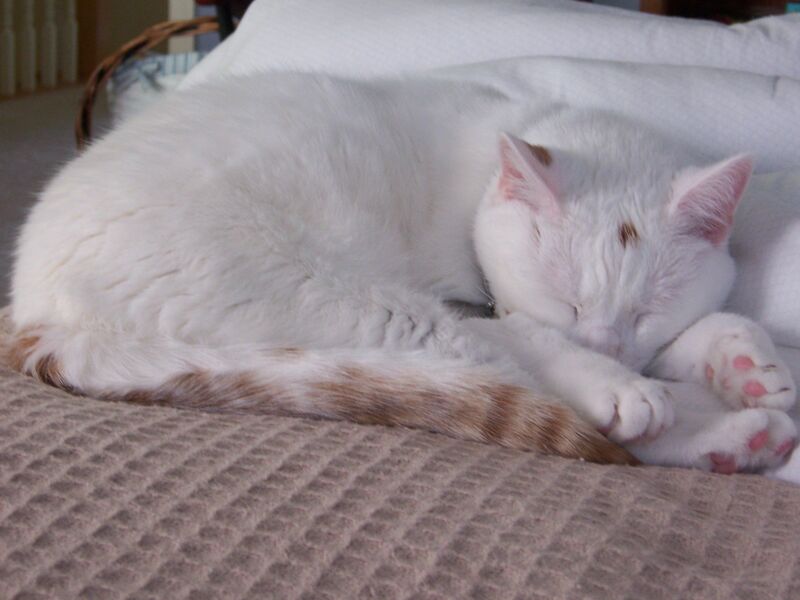 When I spent four months on bed rest during my pregnancy with Fox, Frank laid at my feet every day, watching over me like a little feline guardian angel. He was very loving and affectionate with everyone, nearly like a dog that way. And he had a funny way of trilling his meow, like he was rolling his Rs. He even had a little kiss spot on his forehead and would come sit on my lap until I gave him his kiss. Though Frank’s time on earth was shorter than any of us would have hoped, the truth is that we usually outlive our furry companions. When they go to the rainbow bridge, they leave their little paw prints right across our hearts. Most animal lovers never forget their furry friends. Many writers, myself included, love to immortalize their lost pets in print. 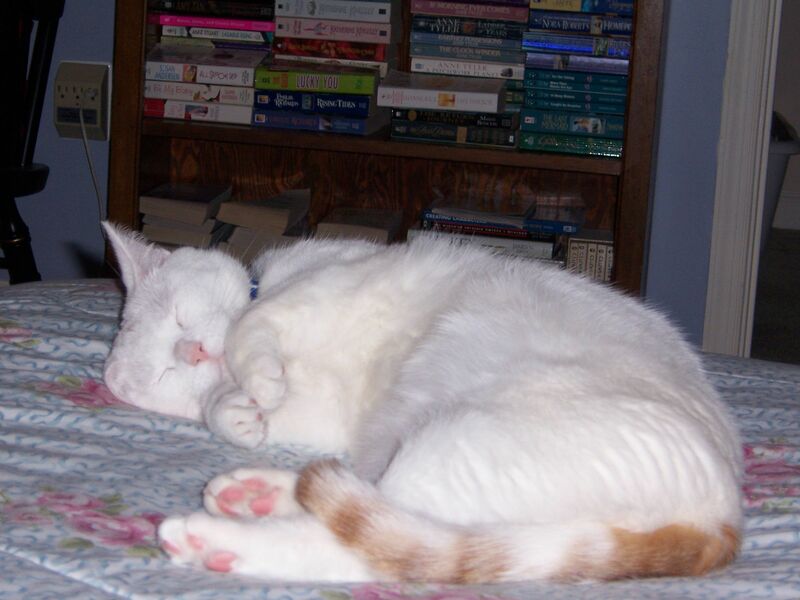 So, all white cats will forever be Frank in my books, where they never have to leave for the rainbow bridge. 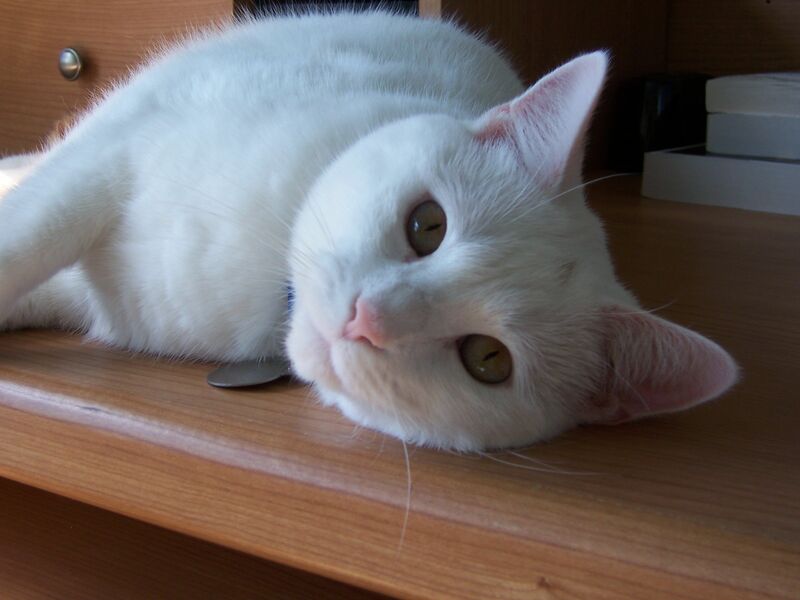 And someday, I hope to get to see my little white fluff ball again. But not for a while yet…I’ve got more books to write.